> a stepped pyramid then enlarged again. I hear you, but that's speculation, not physical evidence of the core tower principle. If that mastaba was first built into its own step pyramid, that still doesn't provide for a central "core tower". As I said, the fact that some pyramids are still standing relatively intact might be an indication that they were NOT of the "core tower" design. At least not like Meidum with its failed outer skin(s). > > tower design, despite their state of disrepair. Again, you're exrapolating from Meidum to the satellite and haven't shown that the upper walls of the satellite extend down into the step such that the step is a separate skin added onto a central core tower. Otherwise, that upper structure might simply be the middle step of a three step pyramid, the blocks of the top step being severely eroded and/or pilfered. > > all OK pyramids (afaik). As I said, the "core tower" model requires that the courses of an independent inner tower were first constructed and then subsequently added onto by applying one or more outer skins onto the existing inner tower structure. For that to be proven as fact it must first be verified that the outer walls of the inner tower structure continue down into the depths of the courses of the outer layer(s) that was added on afterwards such that the outer walls could slough off as we see at Meidum. Ergo "pit within the fruit", "skins of a square onion", etc. > > design for those pyramids? > wouldn't know what the core was of G3. It's difficult to assess from the photo you posted since the viewpoint seems to indicate more than one "step" was revealed by that gash. It's not clear to me that what's exposed is a single vertical wall. What I'm seeing in the lower aspect of that gash is a step protruding out from the upper vertical wall. But maybe not. Do you know of any other photos that might reveal the contours of that exposed gash in comparative detail, perhaps from a slightly different viewpoint? > > as widespread as you're suggesting. I'm not as optimistic; I still see a lot of extrapolation and assumptions being made; it's not all based on direct definitive observations of the physical evidence in each pyramid. > > implications to you if that were true? Sorry to belabor the point, but the G3 gash seems ambiguous (to me at least so far) and could be showing a couple of inner steps rather than a single vertical core. In that case, the outer pyramid skin might have been added onto the step format as a final stage of contemporaneous (original) construction and not necessarily by an adaption (or even adoption) culture. In that regard, I think it's possible that Meidum either was a prototype experiment that failed, or that it was originally intended to be a tower structure but a more techincally naive adaption culture came along later and tried to turn it into a true pyramid, and obviously failed. I also think it's possible that the Step 'mid may be an incomplete project, or perhaps was a prototype of what was then a new "step" design that might never have been intended to be a true pyramid with flat outer faces. 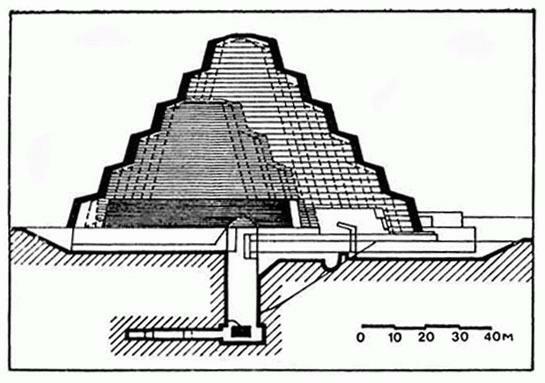 In any case, from a structural engineering standoint, the key to making Meidum retain a true pyramid structure would have been to rework the surface of the inner core tower to create recesses in the outerwalls that could receive blocks from the subsequently applied outers skin as a method to interlock that outerskin with the tower in order to create structural stability. Any structural engineer who knows about mudslides and the general principle of coefficient of friction and slippage knows the importance of anchoring an outer structure to the inner substructure. Those rough intermittent horizontal bands on Meidum might have been a naive attempt by later engineers to create anchors for the E3 and E3 layers, but that obviously wasn't sufficient to maintain the integrity of the structure. Edited 4 time(s). Last edit at 28-Mar-18 13:27 by Origyptian.